Oct 12, 2016 (LBO) – Sri Lanka’s Asia Capital and Japanese Belluna company announced the launch of an apartment development project with an investment of 50 million US dollars in Colombo, Wednesday. “This joint project cements the strong bond that both companies have in creating a new paradigm in local and foreign joint venture projects in Sri Lanka,” Stefan Abeyesinhe, director and group chief executive, Asia Capital said. The apartments will range from two to four bedrooms within a price range of 35 million rupees to 140 million rupees. Onsite piling for the project has already commenced by Nawaloka Piling Pvt. Ltd and ‘Luna Tower – Four Four Seven’, is scheduled for completion by October 2019. Luna Tower is a 200-apartment building located centrally at Union Place, offering convenient access to the commercial and entertainment areas of Colombo. 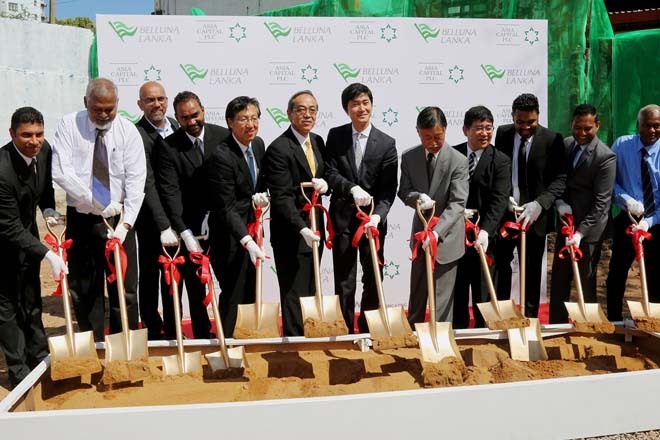 “With operations in several continents, Belluna is delighted to invest in a country such as Sri Lanka, which is one of the leading nations in the region in terms of investment potential,” Hiroshi Yasuno, managing director, Belluna said. The joint projects between Asia Capital and Belluna consist of the ‘Luna Tower – Four Four Seven’ apartment; a 48 villa ultra-luxurious resort in Galle for which the foundation stone will be laid on 13th October 2016; a 300-room city hotel on Marine Drive in Colombo 03 for which the land is already acquired; and construction of the first resort beyond the shores of Sri Lanka in the Maldive Islands, a statement said. A further multi-development project in Colombo is in the pipeline, with land being sourced presently.